There is a castle called Blantyre in Lenox, Massachusetts. Built in 1903 for Robert W. Patterson of New York City. The architect was Robert W. Robertson of the firm Robertson and Potter, New York. The story goes that Robertson after viewing the location was asked to design something. He then did a rough sketch on the back of an envelop which was then given to Mr. Patterson who agreed on the design. It was built like this sketch on the 220 acre estate. The house was modeled after his wife's (Livingston) ancestral home in Lanarkshire, Scotland in the town of Blantyre. Construction began in 1901 at times employing 300 people on the grounds and buildings. In addition to the main house, there was seven outbuildings, including an icehouse, stables for 16 horses, and a carriage house, as well as extensive greenhouses. The house was 165 x 50 feet with a 30 x 75 extension for servants quarters The main house was furnished in English style with all the furniture being brought in from England. Patterson had an extensive art collection in the mansion and the walls were adorned with trophy animal heads from his hunts in the US. and Canada. 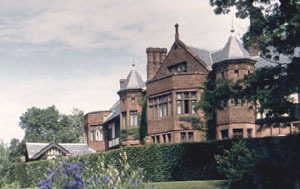 In addition to their Lenox estate, the Pattersons had a New York home, a Canadian fishing lodge, and a winter retreat in Georgia. Visit the Blantyre homepage by clicking here.